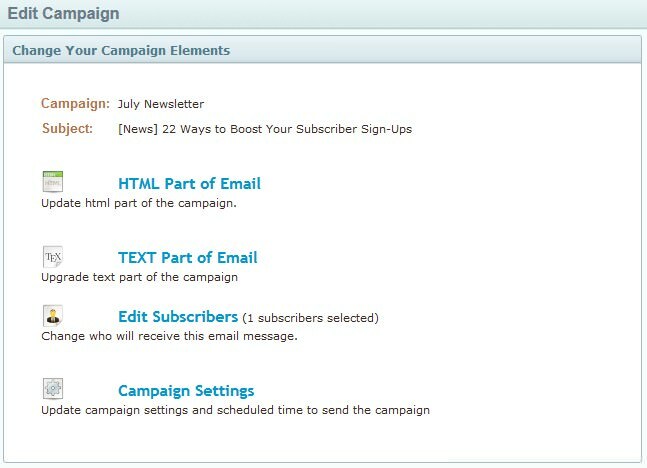 Sometimes you just want to quickly copy an email campaign, tweak it a bit and send it out to your subscribers. This Knowledge Base article will walk you through exactly how to do that. 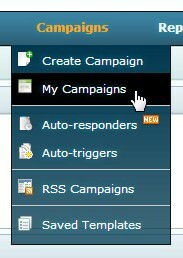 Step 1: Hover over the "Campaigns" section of the main nav bar → Then click on the "My Campaigns" option from the menu → A new page will load with all of your campaigns listed. Clicking on this option will open up a new page with whichever editor you used to create the campaign previously. Edit your campaign to your liking. Clicking on this option will let you modify and edit the text portion of your email. Clicking on this option will take you to a page showing you the lists that you can attach to this campaign. Select the list that you want this campaign to go out to. Clicking on this option will take you to a page where you can verify and modify the various elements of the campaign. This is where you'll set a time and date for the campaign to be released at or choose the option to send the campaign now. Once you have completed and edited the above 4 Major areas of the campaign you will have successfully created a copy of your campaign.